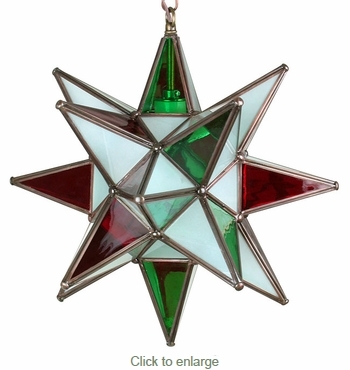 This Mexican star light with red, white and green colored glass is designed to create festive lighting to accent your Southwest or Mexican decor. All of our hanging Mexican stars are authentic creations handmade by artisans in Mexico. Small Tin Ceiling Plate 5" Dia. Large Tin Ridged Ceiling Plate 6" Dia. $10.45 Small Tin Ridged Ceiling Plate 4.5" Dia.